When many students make it out to the baseball field it’s for a few hours of team pride and relaxation – but when Christian Norton heads out on the diamond it’s to make a difference. Norton is a volunteer for Miracle League, a national baseball league for children with disabilities. There are 320 leagues across America as well as in Puerto Rico, Canada and Australia. 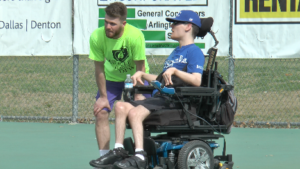 Grace Whetstone, the Executive director of Miracle League DFW, said the league is for people with all types of disabilities — physical and mental. Norton worked with a player named Chris who was in a wheelchair. He helped him play in the outfield and wheel around the bases. Terry and Cathy McGillivray have also been volunteering with the Miracle League since 2007. Cathy said some of the kids have grown up playing together and have become the best of friends. 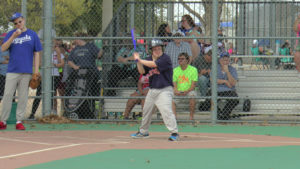 The Miracle League serves more than 200,000 children and young adults with disabilities. Whetstone said the biggest challenge is finding people to be volunteer buddies. Whetstone’s favorite thing to see is when a child actually experiences the game of baseball. 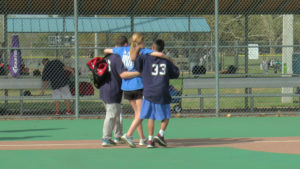 The Miracle League has games all day on Saturdays for six weeks in the Fall and six weeks in the Spring. For more information about volunteering for the league, click here. Madison Goforth is a Senior journalism major from Tyler, Texas.